Pigeon has been revived by chefs over the last few years. The two types you might come across on menus and in supermarkets are squab pigeon, a young, plump, farmed bird, and wood pigeon. On the whole, wood pigeon are wild birds although in some instances - French pigeon in particular - these are also farmed. Pigeon meat is usually available all year round, but it is generally considered to be at its best between October and January and its rich, gamey taste makes it ideal for serving with earthy autumnal ingredients such as mushrooms, butter beans and cobnuts. In the same way that orange is a natural foil for duck, cherries can perform a similar role with pigeon. As Luke Holder demonstrates in his Pigeon and foie gras recipe, the sweetness of the fruit offers a great counterpoint to the bird’s rich flavour. Most sweet flavours will work well with pigeon; Mark Dodson serves his Breast of pigeon with a blueberry jus. 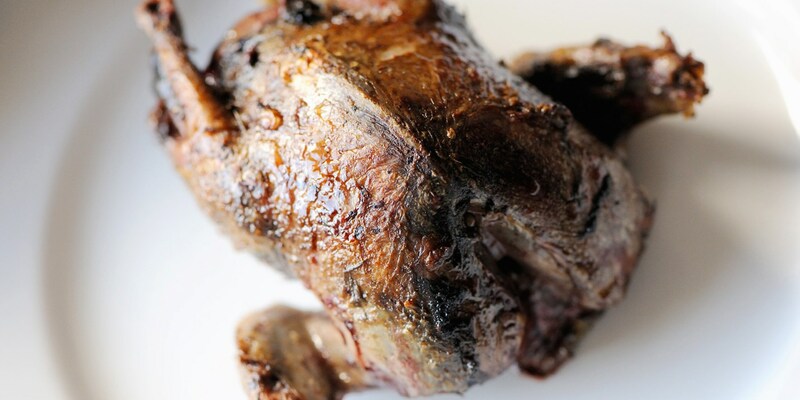 Pigeon is a fantastic meat to use for an extra special Sunday roast. Alan Murchison’s Easy pigeon recipe is full of wonderful autumnal flavours, while Andy McLeish’s impressive Roast wood pigeon recipe is served with a golden pithivier of leg meat and stunning seasonal vegetables such as kale and Jerusalem artichokes.